A friend at work is expecting her 1st baby, and the co-workers decided to get together and surprise her with a gift. Well, guess who gets to make the card? (I actually volunteered.) I hope I do everyone proud! I used the New Arrival Cricut cartridge and made this cute little giraffe. I added some light blue rhinestone eyes and chalked in some rosy cheeks. The papers are from Close to my Heart (I think) and the card base is Bazzil cardstock. Can you guess what she is expecting? It's fairly simple, but I think sometimes simple can be exactly the perfect message you want to convey! 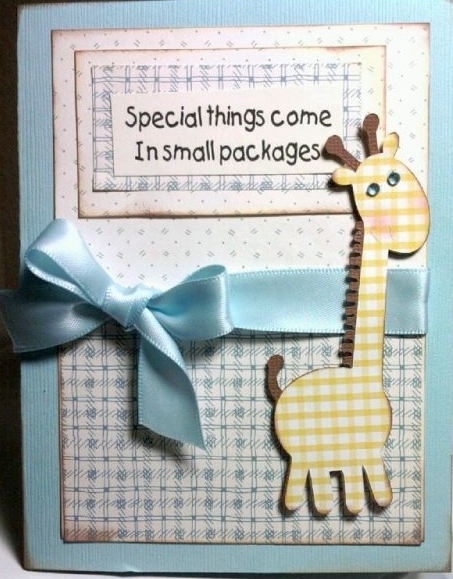 Great little giraffe. She is going to love this card. She must be expecting a boy. This is so stinkin' cute, Shelley you always do amazing work.